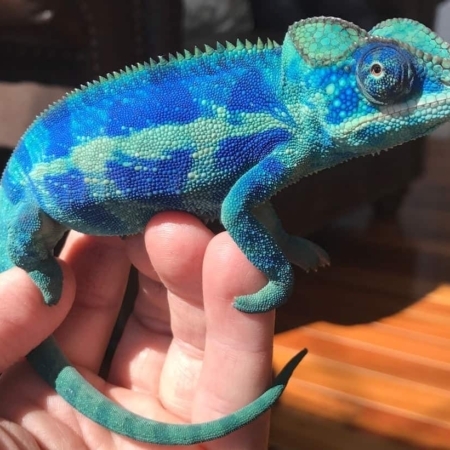 Please take a moment to review our Chameleon care sheet so that you are ready to properly care for your new pet chameleon for sale! 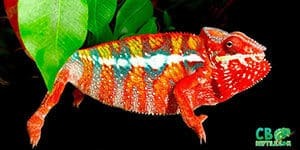 Congratulations on choosing a chameleon as your next pet reptile! It is VERY important that you follow the instructions below IMMEDIATELY to ensure your new is happy, healthy and well fed and hydrated. To make locating prey items easier for your baby chameleon, cage your new pet in a small enclosure. All screen cages 16 inches long by 16 inches wide by 20 inches tall will work for the first six months of life. 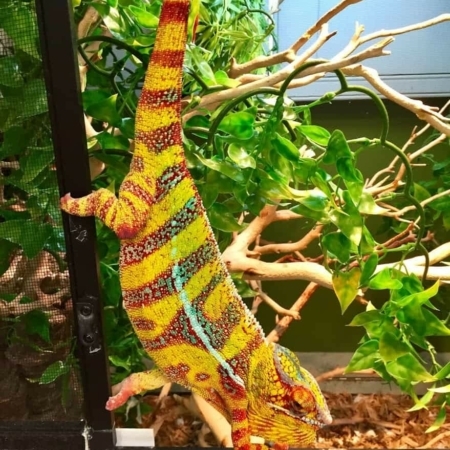 After that, adult male panther chameleons should be kept in a minimum of 18 inches long by 18 inches wide by 36 inches tall enclosures, whereas female panther chameleons can be kept in 16 inches long by 16 inches wide by 30 inches tall enclosures. These sizes are the absolute minimum, and as always, bigger is better! Decorate the cage with live, nontoxic plants and various sticks or vines. Ficus Benjamina, Schefflera, and Pothosplants all make great choices. 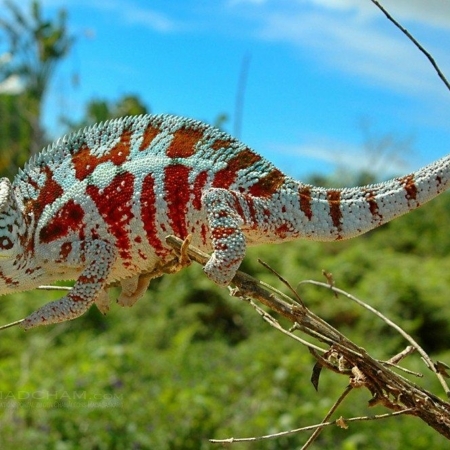 Chameleons love to climb, and live plants will give them places to hide and feel secure. 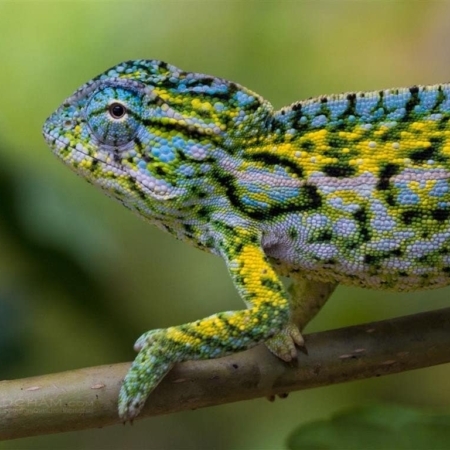 Screen is always preferred over glass, as chameleons can easily get an upper respiratory infection if kept in stagnant air. We recommend the Zoo med Reptibreeze medium for females and juveniles and the Reptibreeze XL for the adult males. The deluxe models with glass viewing doors are preferred and will help maintain humidity. Provide two types of light: one UVB bulb (we recommend the ReptiSun 5.0 for smaller cages and 10.0 for larger) the more foliage you have inside the cage the better, and the higher wattage UVB lamp you will need to provide adequate UVB exposure. 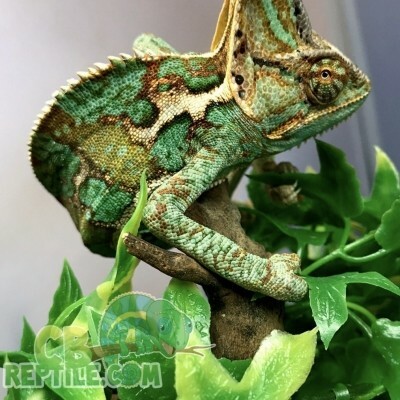 If you are utilizing a live plant inside the habitat, consider purchasing a T5 dual lamp fixture and adding one 10k grow / uva lamp for the plant, and and a UVB lamp for the chameleon. 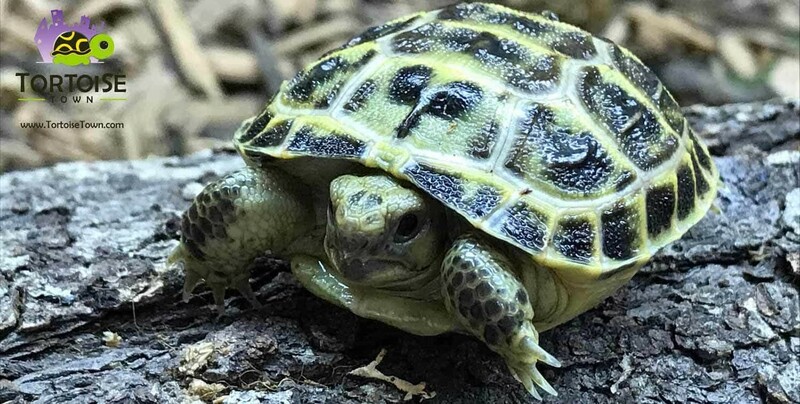 Adult chameleons need a basking spot of around 100 degrees Fahrenheit with the ambient temperature between 75 to 85 degrees; smaller panther chameleons should have a basking area of 85 to 90 degrees with a lower ambient temperature of around 75 degrees. It is important for panther chameleons to thermoregulate. That is why you place lights toward the top of the cage. Chameleon cages are best left with a bare bottom. 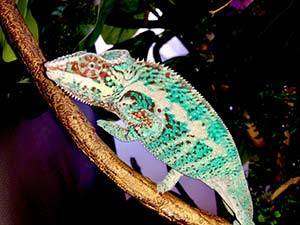 Substrate will only complicate the cleaning of your chameleon’s cage and give insects a place to hide. If you choose to have substrate, keep it simple with paper towels or newspaper. Humidity is provided when you water your plants and chameleon. 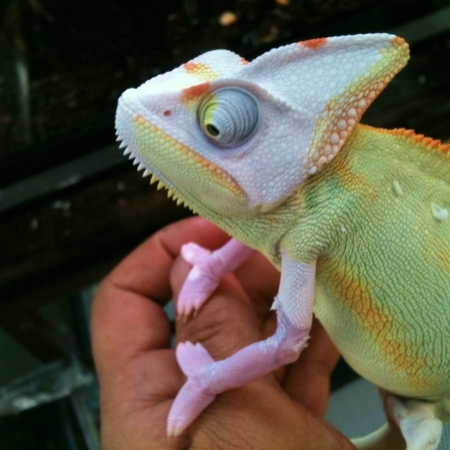 It is VERY important that you have the right SIZED crickets for juvenile and baby chameleons. We recommend a 1 week old cricket (1/16”) for all chameleons 0-6 months old, with 2 week old crickets being an option around month 3. A good diet is a varied diet! 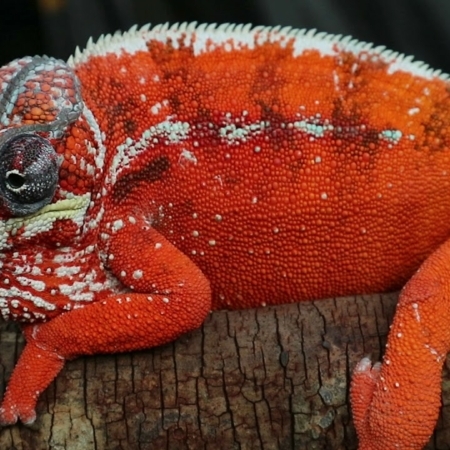 Crickets are the main staple, but superworms, silkworms, hornworms, waxworms, roaches, stick bugs, etc., can all – and should all – be offered to your panther chameleons. Make sure you feed gut-loaded insects. It is also necessary to dust your insects with vitamin powders. You can do this a number of ways. I recommend doing calcium three times a week, calcium with D3 once a week, a small dusting of Miner-All one time a week and Herptavite one time every other week. Water is one of the most important things to consider when keeping achameleon, as they love to drink and need to every day. Misting the chameleon two to three times a day will keep the humidity in the required 60 to 70 percent range and will also allow the animal a chance to drink but will not provide proper hydration. 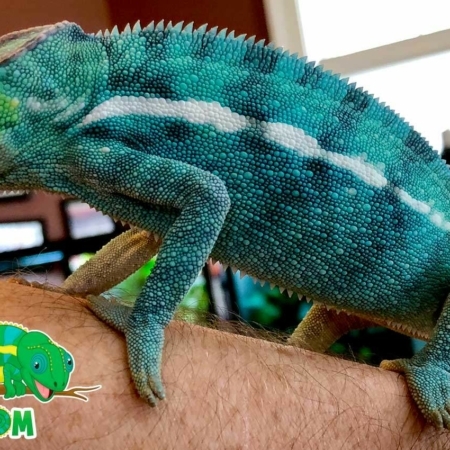 We believe a proper misting system is 100% NECESSARY with all chameleon species. We highly recommend the MIST KING system, available on our website. 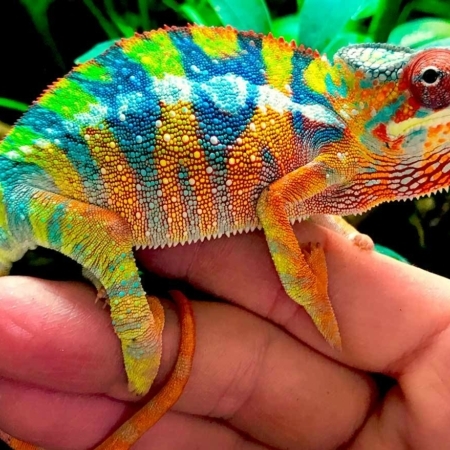 If you have purchased a chameleon, and DO NOT have a misting system setup, please stop what you’re doing and order one OVERNIGHT now, as your new cham will not survive long without one. The best way to run a misting system is to have it come on for 3-4 full 2 minute mists a day, and then 3-4 15-20 second mists per day to maintain humidity. We also suggest running a drip system most of the day at least twice a week. 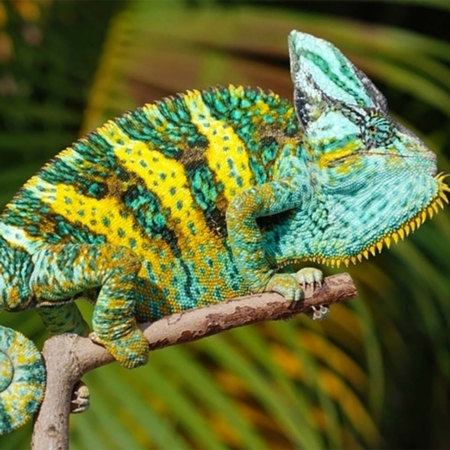 This will allow the chameleon to drink nice full drops of water whenever it likes. It will also keep your plants watered. Panther chameleons are one of the more docile of the common chameleon types, though you can get an occasional grumpy one. Veiled are not as friendly as panthers and tolerate handling less. 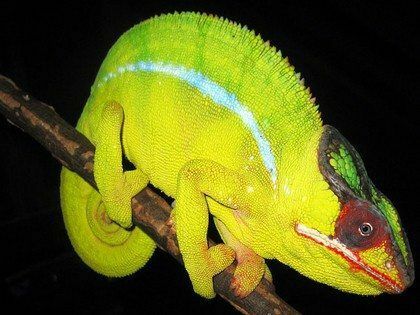 It is important to remember that chameleons like to be left alone. They are a great display animal that should not be handled on a daily basis. 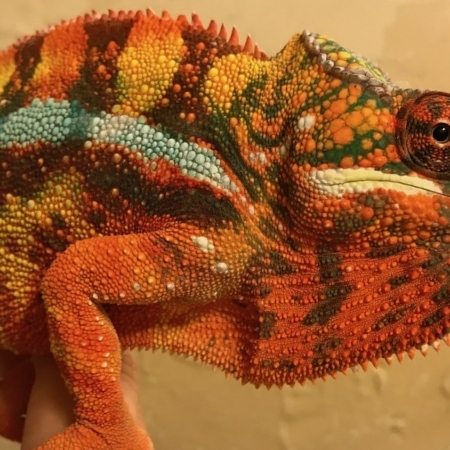 Some tips to remember when handling a chameleon are to approach the chameleon from the bottom. A hand coming from above can be taken as an attack. 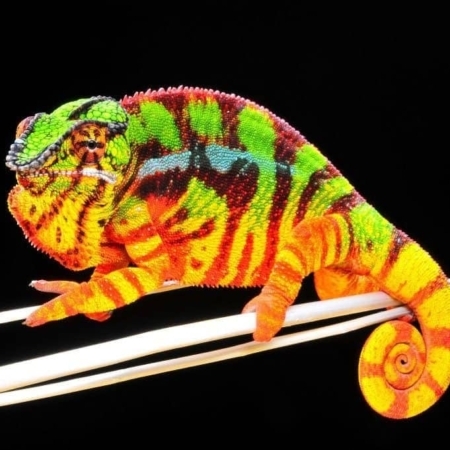 If you have a grumpy chameleon, first coax it onto a stick and then onto your hand or arm. With time, most chameleons come to associate their owner with food and will often come to the door in anticipation of feeding.